MySQL ( /maɪ ˌɛskjuːˈɛl/ "My S-Q-L", e quajtur zyrtarisht , por e quajtur edhe /maɪ ˈsiːkwəl/ "My Sequel") eshte (sipas korrik 2013) [nb 1] widely used open-source relational database management system (RDBMS). It is named after co-founder Michael Widenius's daughter, My. The SQL phrase stands for Structured Query Language. MySQL development project has made its source code available under the terms of the GNU General Public License, as well as under a variety of proprietary agreements. MySQL was owned and sponsored by a single for-profit firm, the Swedish company MySQL AB, now owned by Oracle Corporation. MySQL eshte nje zgjedhje popullore e databazes per perdorim ne web applications, and is a central component of the widely used LAMP open source web application software stack (and other 'AMP' stacks). LAMP is an acronym for "Linux, Apache, MySQL, Perl/PHP/Python." Free-software-open source projects that require a full-featured database management system often use MySQL. For commercial use, several paid editions are available, and offer additional functionality. Applications which use MySQL databases include: TYPO3, MODx, Joomla, WordPress, phpBB, MyBB, Drupal and other software. MySQL is also used in many high-profile, large-scale websites, including Wikipedia, Google (though not for searches), Facebook, Twitter, Flickr, and YouTube. MySQL is a relational database management system (RDBMS), and ships with no GUI tools to administer MySQL databases or manage data contained within the databases. Users may use the included command line tools, or use MySQL "front-ends", desktop software and web applications that create and manage MySQL databases, build database structures, back up data, inspect status, and work with data records. The official set of MySQL front-end tools, MySQL Workbench is actively developed by Oracle, and is freely available for use. The official MySQL Workbench is a free integrated environment developed by MySQL AB, that enables users to graphically administer MySQL databases and visually design database structures. MySQL Workbench replaces the previous package of software, MySQL GUI Tools. Similar to other third-party packages, but still considered the authoritative MySQL front end, MySQL Workbench lets users manage database design & modeling, SQL development (replacing MySQL Query Browser) and Database administration (replacing MySQL Administrator). Adminer – a free MySQL front end written in one PHP script, capable of managing multiple databases, with many CSS skins available. DaDaBIK – a customizable CRUD front-end to MySQL. Written in PHP. Commercial. DBEdit – a free front end for MySQL and other databases. HeidiSQL – a full featured free front end that runs on Windows, and can connect to local or remote MySQL servers to manage databases, tables, column structure, and individual data records. Also supports specialised GUI features for date/time fields and enumerated multiple-value fields. LibreOffice Base - LibreOffice Base allows the creation and management of databases, preparation of forms and reports that provide end users easy access to data. Like Microsoft Access, it can be used as a front-end for various database systems, including Access databases (JET), ODBC data sources, and MySQL or PostgreSQL. Navicat – a series of proprietary graphical database management applications, developed for Windows, Macintosh and Linux. OpenOffice.org – OpenOffice.org Base can manage MySQL databases if the entire suite is installed. Free and open-source. phpMyAdmin – a free Web-based front end widely installed[nevojitet citimi] by web hosts, since it is developed in PHP and is included in the LAMP stack, MAMP, XAMPP and WAMP software bundle installers. SQLBuddy - a free Web-based front end, developed in PHP. SQLyog - commercial, but there is also a free 'community' edition available. Other available proprietary MySQL front ends include dbForge Studio for MySQL, DBStudio, Epictetus, Microsoft Access, Oracle SQL Developer, SchemaBank, SQLPro SQL Client, Toad Data Modeler. MySQL ships with many command line tools, from which the main interface is 'mysql' client. Third-parties have also developed tools to manage, optimize, monitor and backup a MySQL server, some listed below. All these tools work on *NIX type operating systems, and some of them also on Windows. Maatkit - a cross-platform toolkit for MySQL, PostgreSQL and Memcached, developed in Perl. Maatkit can be used to prove replication is working correctly, fix corrupted data, automate repetitive tasks, and speed up servers. Maatkit is included with several Linux distributions such as CentOS and Debian and packages are available for Fedora and Ubuntu as well. As of late 2011, Maatkit is no longer developed, but Percona has continued development under the Percona Toolkit brand. XtraBackup - Open Source MySQL hot backup software. Some notable features include hot, non-locking backups for InnoDB storage, incremental backups, streaming, parallel-compressed backups, throttling based on the number of IO operations per second, etc. MySQL::Replication - a replacement for MySQL's built-in replication, developed in Perl. MySQL::Replication can be used to create a peer-to-peer, multi-master MySQL replication network. SymmetricDS - asynchronous MySQL multi-master replication capable of multi-tier replication and designed for a large number of databases across low-bandwidth connections. Licensed as open source (GPL) with commercial options from JumpMind. MySQL punon ne shume system platforms, perfshire edhe AIX, BSDi, FreeBSD, HP-UX, eComStation, i5/OS, IRIX, Linux, OS X, Microsoft Windows, NetBSD, Novell NetWare, OpenBSD, OpenSolaris, OS/2 Warp, QNX, Solaris, Symbian, SunOS, SCO OpenServer, SCO UnixWare, Sanos and Tru64. A port of MySQL to OpenVMS also exists. MySQL is written in C and C++. Its SQL parser is written in yacc, but it uses a home-brewed lexical analyzer. Many programming languages with language-specific APIs include libraries for accessing MySQL databases. These include MySQL Connector/Net for integration with Microsoft's Visual Studio (languages such as C# and VB are most commonly used) and the JDBC driver for Java. In addition, an ODBC interface called MyODBC allows additional programming languages that support the ODBC interface to communicate with a MySQL database, such as ASP or ColdFusion. The HTSQL - URL-based query method also ships with a MySQL adapter, allowing direct interaction between a MySQL database and any web client via structured URLs. Replication support (i.e. Master-Master Replication & Master-Slave Replication) with one master per slave, many slaves per master. Multi-master replication is provided in MySQL Cluster, and multi-master support can be added to unclustered configurations using Galera Cluster. Partner-developed storage engines (solidDB, Infobright (formerly Brighthouse), Kickfire, XtraDB, IBM DB2). InnoDB used to be a partner-developed storage engine, but with recent acquisitions, Oracle now owns both MySQL core and InnoDB. The developers release monthly versions of the MySQL Server. The sources can be obtained from MySQL's website or from MySQL's Bazaar repository, both under the GPL license. Like other SQL databases, MySQL does not currently comply with the full SQL standard for some of the implemented functionality, including foreign key references when using some storage engines other than the 'standard' InnoDB (or third-party engines which supports foreign keys). Triggers are currently limited to one per action / timing, i.e. maximum one after insert and one before insert on the same table. There are no triggers on views. MySQL, like most other transactional relational databases, is strongly limited by hard disk performance. This is especially true in terms of write latency. Given the recent appearance of very affordable consumer grade SATA interface Solid-state drives that offer zero mechanical latency, a fivefold speedup over even an eight drive RAID array can be had for a smaller investment. MySQL database's inbuilt functions like UNIX_TIMESTAMP() will return 0 after 03:14:07 UTC on 19 January 2038. MySQL can be built and installed manually from source code, but this can be tedious so it is more commonly installed from a binary package unless special customizations are required. On most Linux distributions the package management system can download and install MySQL with minimal effort, though further configuration is often required to adjust security and optimization settings. There are however limits to how far performance can scale on a single server ('scaling up'), so on larger scales, multi-server MySQL ('scaling out') deployments are required to provide improved performance and reliability. A typical high-end configuration can include a powerful master database which handles data write operations and is replicated to multiple slaves that handle all read operations. The master server synchronizes continually with its slaves so in the event of failure a slave can be promoted to become the new master, minimizing downtime. Further improvements in performance can be achieved by caching the results from database queries in memory using memcached, or breaking down a database into smaller chunks called shards which can be spread across a number of distributed server clusters. Ensuring high availability requires a certain amount of redundancy in the system. For database systems, the redundancy traditionally takes the form of having a primary server acting as a master, and using replication to keep secondaries available to take over in case the primary fails. This means that the "server" that the application connects to is in reality a collection of servers, not a single server. In a similar manner, if the application is using a sharded database, it is in reality working with a collection of servers, not a single server. In this case, a collection of servers is usually referred to as a farm. One of the projects aiming to provide high availability for MySQL is MySQL Fabric, an integrated system for managing a collection of MySQL servers, and a framework on top of which high availability and database sharding is built. MySQL Fabric is open-source and is intended to be extensible, easy to use, and to support procedure execution even in the presence of failure, providing an execution model usually called resilient execution. MySQL client libraries are extended so they are hiding the complexities of handling failover in the event of a server failure, as well as correctly dispatching transactions to the shards. As of September 2013, there is currently support for Fabric-aware versions of Connector/J, Connector/PHP, Connector/Python, as well as some rudimentary support for Hibernate and Doctrine. As of November 2013, MySQL Fabric is still in an early alpha development stage. Virtual Machine Image - cloud users can upload a machine image of their own with MySQL installed, or use a ready-made machine image with an optimized installation of MySQL on it, such as the one provided by Amazon EC2. MySQL as a Service - some cloud platforms offer MySQL "as a service". In this configuration, application owners do not have to install and maintain the MySQL database on their own. Instead, the database service provider takes responsibility for installing and maintaining the database, and application owners pay according to their usage. Notable cloud-based MySQL services are the Amazon Relational Database Service; the Xeround Cloud Database, which runs on EC2; Rackspace; HP Converged Cloud; Heroku and Jelastic. Managed MySQL cloud hosting - the database is not offered as a service, but the cloud provider hosts the database and manages it on the application owner's behalf. As of 2011, of the major cloud providers, only Terremark and Rackspace offer managed hosting for MySQL databases. The MySQL server software itself and the client libraries use dual-licensing distribution. They are offered under GPL version 2, beginning from 28 June 2000 (which in 2009 has been extended with a FLOSS License Exception) or to use a proprietary license. In 2013, the Linux man pages for MySQL switched to a proprietary license temporarily due to a build system bug. The original GPL license has since been restored. Support can be obtained from the official manual. Free support additionally is available in different IRC channels and forums. Oracle offers paid support via its MySQL Enterprise products. They differ in the scope of services and in price. Additionally, a number of third party organisations exist to provide support and services, including SkySQL Ab and Percona. MySQL has received positive reviews, and reviewers noticed it "performs extremely well in the average case." and that the "developer interfaces are there, and the documentation (not to mention feedback in the real world via Web sites and the like) is very, very good". It has also been tested to be a "fast, stable and true multi-user, multi-threaded sql database server". Drizzle – a fork targeted at the web-infrastructure and cloud computing markets. The developers of the product describe it as a "smaller, slimmer and (hopefully) faster version of MySQL". As a result, many common MySQL features will be stripped out, including stored procedures, query cache, prepared statements, views, and triggers. This is a partial rewrite of the server that does not maintain compatibility with MySQL. MariaDB – a community-developed fork of the MySQL database source code, the impetus being the community maintenance of its free status under GPL as opposed to any uncertainty of MySQL license status under its current ownership by Oracle. The intent also being to maintain high fidelity with MySQL, ensuring a "drop-in" replacement capability with library binary equivalency and exact matching with MySQL APIs and commands. It includes the XtraDB storage engine as a replacement for InnoDB. Percona Server – a fork of MySQL that includes the XtraDB storage engine. Its policy is to deviate as little as possible from MySQL and remain fully compatible, while providing new features, better performance, and additional instrumentation for analysis of performance and usage. OurDelta – No longer maintained. It was a fork compiled with various patches, including patches from MariaDB, Percona, and Google, and a storage engine called OQGRAPH. MySQL was created by a Swedish company, MySQL AB, founded by David Axmark, Allan Larsson and Michael "Monty" Widenius. The first version of MySQL appeared on 23 May 1995. It was initially created for personal usage from mSQL based on the low-level language ISAM, which the creators considered too slow and inflexible. They created a new SQL interface, while keeping the same API as mSQL. In October 2005, Oracle Corporation acquired Innobase OY, the Finnish company that developed the third-party InnoDB storage engine that allows MySQL to provide such functionality as transactions and foreign keys. After the acquisition, an Oracle press release mentioned that the contracts that make the company's software available to MySQL AB would be due for renewal (and presumably renegotiation) some time in 2006. During the MySQL Users Conference in April 2006, MySQL issued a press release that confirmed that MySQL and Innobase OY agreed to a "multi-year" extension of their licensing agreement. In January 2008, Sun Microsystems bought MySQL for $1 billion. In April 2009, Oracle Corporation entered into an agreement to purchase Sun Microsystems, then owners of MySQL copyright and trademark. Sun's board of directors unanimously approved the deal, it was also approved by Sun's shareholders, and by the U.S. government on 20 August 2009. On 14 December 2009, Oracle pledged to continue to enhance MySQL as it had done for the previous four years. A movement against Oracle's acquisition of MySQL, to "Save MySQL" from Oracle was started by one of the MySQL founders, Monty Widenius. The petition of 50,000+ developers and users called upon the European Commission to block approval of the acquisition. At the same time, several Free Software opinion leaders (including Eben Moglen, Pamela Jones of Groklaw, Jan Wildeboer and Carlo Piana, who also acted as co-counsel in the merger regulation procedure) advocated for the unconditional approval of the merger. [nevojitet citimi] As part of the negotiations with the European Commission, Oracle committed that MySQL server will continue until at least 2015 to use the dual-licensing strategy long used by MySQL AB, with commercial and GPL versions available. The antitrust of the EU had been "pressuring it to divest MySQL as a condition for approval of the merger". But, as revealed by Wikileaks, the US Department of Justice and Antitrust, at the request of Oracle, pressured the EU to unconditionally approve the merger. The European Commission eventually unconditionally approved Oracle's acquisition of MySQL on 21 January 2010. In January 2009, prior to Oracle's acquisition of MySQL, Monty Widenius started a GPL-only fork, MariaDB. MariaDB is based on the same code base as MySQL server 5.1 and strives to maintain compatibility with Oracle-provided versions. In August 2012, TechCrunch's Alex Williams reported that Oracle was holding back MySQL Server test cases, a move that he concluded indicated that Oracle is attempting to kill the product. Percona also reported that Oracle is no longer synchronizing their changes with the public source repositories. Widenius called this a breach of the agreement that Oracle entered into with the EU as a condition of their acquisition of Sun. Since the final quarter of 2012, several Linux distributions and some important users (like Wikipedia and Google) started to replace MySQL with MariaDB. MySQL 5.1 and 6.0 showed poor performance when used for data warehousing — partly due to its inability to utilize multiple CPU cores for processing a single query. MySQL 5.6, a development milestone release, was announced at the MySQL users conference 2011. New features include performance improvements to the query optimizer, higher transactional throughput in InnoDB, new NoSQL-style memcached APIs, improvements to partitioning for querying and managing very large tables, improvements to replication and better performance monitoring by expanding the data available through the PERFORMANCE_SCHEMA. In July further previews with a BINLOG API, group commit, and InnoDB full text searching were released. ^ Following Sqllitee dyta ne bote per sa i perket gjeresise se perhapjes, which is deployed with every iPhone and Android device along with the Chrome and Firefox browsers. In the second quarter of 2013 alone, 213 million smartphones shipped, of which 200 million were Android and iOS. ^ "Changes in MySQL 5.6.15". MySQL 5.6 Reference Manual. Oracle. 3 December 2013. Marrë më 3 December 2013. ^ "MySQL: Project Summary". Ohloh. Black Duck Software. Marrë më 17 September 2012. ^ "Well-Known Users of SQLite". The SQLite Consortium. Marrë më 8 October 2013. Apple uses SQLite for many functions within Mac OS X, including Apple Mail, Safari, and in Aperture. Apple uses SQLite in the iPhone and in the iPod touch and in iTunes software. .... SQLite is the primary meta-data storage format for the Firefox Web Browser and the Thunderbird Email Reader from Mozilla. .... It is known that Google uses SQLite in their Desktop for Mac, in Google Gears, in the Android cell-phone operating system, and in the Google Chrome Web Browser. ^ "Market Share". Why MySQL?. Oracle. Marrë më 17 September 2012. ^ "DB-Engines Ranking". Marrë më 29 July 2013. ^ Schumacher, Robin; Lentz, Arjen. "Dispelling the Myths". MySQL AB. Arkivuar nga origjinali më 6 June 2011. Marrë më 17 September 2012. ^ "History of MySQL". MySQL 5.1 Reference Manual. MySQL AB. Marrë më 26 August 2011. 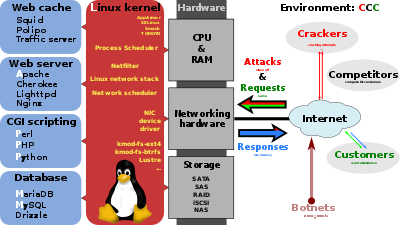 ^ "Wikimedia servers — System architecture". Wikimedia Meta-Wiki. Wikimedia Foundation. Marrë më 17 September 2012. ^ Claburn, Thomas (24 April 2007). "Google Releases Improved MySQL Code". InformationWeek. InformationWeek. Marrë më 30 November 2008. ^ MySQL at Facebook. Google. Retrieved on 3 August 2010. "x,000 servers, ... Master-slave replication, InnoDB"
^ Sobel, Jason (21 December 2007). "Keeping Up". The Facebook Blog. Facebook. Marrë më 30 October 2008. ^ Malik, Om (25 April 2008). "Facebook's Insatiable Hunger for Hardware". GigaOM. GigaOmniMedia. Marrë më 30 October 2008. ^ Big and Small Data at @Twitter. Google. Retrieved on 20 October 2011. ^ "MySQL Customer: Flickr". MySQL Customers. Oracle. Marrë më 17 September 2012. ^ "MySQL Customer: YouTube". MySQL Customers. Oracle. Marrë më 17 September 2012. ^ "HeidiSQL Grid editing features". ^ "LibreOffice Base". Marrë më 5 January 2012. ^ Home. "Maatkit website". Maatkit.org. Marrë më 5 November 2012. ^ "XtraBackup". Percona. Marrë më 19 January 2013. ^ Home. "MySQL::Replication". Opera Software. Marrë më 11 December 2012. ^ Jean-François Piéronne. "PCSI Kits of Open Source Software for OpenVMS". Pi-net.dyndns.org. Marrë më 8 June 2009. ^ "MySQL Internals Manual". Dev.mysql.com. 4 March 2009. Marrë më 8 June 2009. ^ "Which Should I Use: MySQL Enterprise or MySQL Community Server?". MySQL AB. Marrë më 8 April 2009. ^ Guy Harrison; Steven Feuerstein (2008). MySQL Stored Procedure Programming. O'Reilly Media. f. 49. 978-0-596-10089-6. ^ "MySQL University: MySQL Galera Multi-Master Replication". Oracle Corporation. 2010-02-09. ^ "MySQL :: InnoDB 1.1 for MySQL 5.5 User's Guide :: C InnoDB Glossary :: ACID". Marrë më 5 January 2011. ^ "4.6.9. mysqlhotcopy - A Database Backup Program". MySQL 5.1 Reference Manual. Oracle. Marrë më 23 September 2009. mysqlhotcopy is a Perl script [...]. It uses Lock Tables, Flush Tables, and cp or scp to make a database backup quickly [...] but it can be run only on the same machine where the database directories are located. mysqlhotcopy works only for backing up MyISAM and Archive tables. It runs on Unix and NetWare. ^ "The DB2 for i (IBMDB2I) Storage Engine for MySQL on IBM i". MySQL. Marrë më 18 January 2010. ^ "Group commit in PostgreSQL". Marrë më 8 April 2012. ^ "dev.mysql.com". dev.mysql.com. Marrë më 1 February 2012. ^ a b "dev.mysql.com". dev.mysql.com. Marrë më 1 February 2012. ^ "MySQL Innodb ZFS Best Practices". Blogs.oracle.com. Marrë më 2013-04-16. ^ 11 September 2012 (2012-09-11). "Intel SSD 910 vs HDD RAID in tpcc-mysql benchmark". Mysqlperformanceblog.com. Marrë më 2013-04-16. ^ Matsunobu, Yoshinori. "SSD Deployment Strategies for MySQL." Sun Microsystems, 15 April 2010. ^ "aj_blk: Year 2038 Bug". Ajoeblk.blogspot.in. Marrë më 2013-03-12. ^ "The future of replication in MySQL". Facebook. Marrë më 9 December 2009. ^ "Database Sharding". Code Futures. Marrë më 9 December 2009. ^ a b Mats Kindahl (2013-09-21). "A Brief Introduction to MySQL Fabric". mysqlmusings.blogspot.com. Marrë më 2013-12-12. ^ Mats Kindahl; Alfrano Correia; Narayanan Venkateswaran (2013-11-13). "MySQL Fabric: Easy Management of MySQL Servers". slideshare.net. Marrë më 2013-12-12. ^ "Running MySQL on Amazon EC2 with EBS (Elastic Block Store)". Amazon Web Services. Marrë më 5 February 2013. ^ "MySQL Server Support at Rackspace". Rackspace.com. Marrë më 10 November 2011. ^ "Managed Hosting - Terremark". Terremark.com. ^ "Oracle :: MySQL Open Source License". Mysql.com. Marrë më 8 June 2009. ^ "MySQL GOES GPL". Arkivuar nga origjinali më 12 August 2001. ^ "Oracle :: FLOSS License Exception". Mysql.com. Marrë më 8 June 2009. ^ "Oracle :: MySQL Commercial License". Mysql.com. Marrë më 8 June 2009. ^ "MySQL man pages silently relicensed away from GPL". MariaDB Foundation. 18 June 2013. Marrë më 18 June 2013. ^ "MySQL Bugs: #69512: Wrong license in man pages in Community Server". Oracle bugtracking system. 19 June 2013. Marrë më 25 June 2013. ^ Morgan Tocker (2009-08-13). "XtraDB: The Top 10 enhancements". mysqlperformanceblog.com. Marrë më 2013-12-16. ^ Vadim Tkachenko (2010-12-21). "MySQL 5.5.8 and Percona Server on Fast Flash card (Virident tachIOn)". mysqlperformanceblog.com. Marrë më 2013-12-16. ^ Basil, Tom (4 September 2001). "Eyewitness account: "Monty Widenius, International Fugitive"". MySQL Life (Listë abonentësh). Marrë më 16 September 2012. ^ "FAQ on MySQL vs. NuSphere Dispute". MySQL AB. 13 July 2001. Arkivuar nga origjinali më 17 July 2001. Marrë më 16 September 2012. ^ "Affidavit of Eben Moglen on Progress Software vs. MySQL AB Preliminary Injunction Hearing". Arkivuar nga origjinali më 2005-02-07. ^ Babcock, Charles (14 February 2006). "Oracle Buys Sleepycat, Is JBoss Next?". InformationWeek. CPM Media. Marrë më 16 September 2012. ^ "Changes in MySQL 5.1.12". MySQL 5.1 Reference Manual. MySQL AB. 24 October 2006. Marrë më 16 September 2012. ^ Thomasch, Paul; Finkle, Jim (20 August 2009). "Oracle wins U.S. approval to buy Sun Microsystems". Reuters. Marrë më 16 September 2012. ^ Whitney, Lance (14 December 2009). "Oracle pledges to play well with MySQL". CNET. CBS Interactive. Marrë më 16 September 2012. ^ Michael, Widenius (12 December 2009). "Help saving MySQL". Monty Says. Google. Marrë më 16 September 2012. ^ Kanaracus, Chris (30 August 2011). "Wikileaks Cable Offers New Insights Into Oracle-Sun Deal". PC World. IDG. Marrë më 16 September 2012. ^ "MariaDB versus MySQL - Compatibility". AskMonty Knowledgebase. Monty Program. 30 July 2010. Marrë më 16 September 2012. ^ Williams, Alex (18 August 2012). "Oracle Makes More Moves To Kill Open Source MySQL". TechCrunch. AOL. Marrë më 16 October 2012. ^ Smith, Stewart (16 August 2012). "Where to get a BZR tree of the latest MySQL releases". MySQL Performance Blog. Percona. Marrë më 16 October 2012. ^ Clarke, Gavin (2012-11-29). "Monty on broken MySQL promises: Oracle's going to fork it up". Theregister.co.uk. Marrë më 2013-04-16. ^ "Five Questions With Michael Widenius - Founder And Original Developer of MySQL". www.opensourcereleasefeed.com. Arkivuar nga origjinali më 2009-03-13. Marrë më 13 October 2012. ^ "MySQL 3.23 Declared Stable". Arkivuar nga origjinali më 15 August 2001. ^ "Capttofu: FederatedX Pluggable Storage Engine Released!". Capttofu.livejournal.com. Marrë më 3 April 2009. ^ "Oreillynet.com". Oreillynet.com. 9 October 2008. Marrë më 1 February 2012. ^ "Sun Picks Up MySQL For $1 Billion; Open Source Is A Legitimate Business Model". Marrë më 13 October 2012. ^ "Archives - Oops, we did it again (MySQL 5.1 released as GA with crashing bugs)". Planet MySQL. 29 November 2008. Marrë më 5 February 2013. ^ "TPC-H Run on MySQL 5.1 and 6.0 | MySQL Performance Blog". MySQL Performance Blog. Marrë më 8 June 2009. ^ "Oracle.com". Oracle.com. 7 September 2010. Marrë më 1 February 2012. ^ "MySQL Lists: packagers: MySQL 6.0.11 Alpha has been released!". Lists.mysql.com. Marrë më 1 February 2012. ^ "What's New in MySQL 5.6". MySQL Developer Zone. Marrë më 21 April 2011. ^ "B.3. Changes in Release 3.23.x (Lifecycle Support Ended)". Oracle. Marrë më 24 August 2010. ^ "B.2. Changes in Release 4.0.x (Lifecycle Support Ended)". Oracle. Marrë më 24 August 2010. ^ "B.1. Changes in Release 4.1.x (Lifecycle Support Ended)". Oracle. Marrë më 24 August 2010. ^ "C.1. Changes in Release 5.0.x (Lifecycle Support Ended)". Oracle. Marrë më 24 August 2010. ^ "C.1. Changes in Release 5.1.x (Production)". Oracle. Marrë më 24 August 2010. ^ "C.1. Changes in Release 5.5.x (Production)". Oracle. Marrë më 24 August 2010. ^ "C.1. Changes in Release 5.6.x (Development)". Oracle. Marrë më 24 August 2010. Wikimedia Commons ka materiale multimediale në lidhje me: MySQL. Kjo faqe është redaktuar për herë te fundit më 31 janar 2017, në orën 16:23.